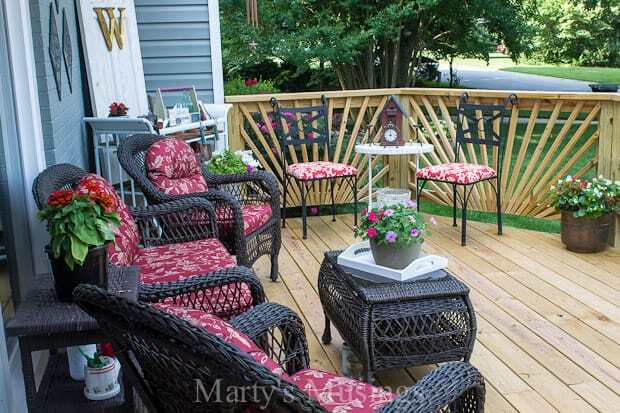 Want to add pizzazz to an ordinary deck? 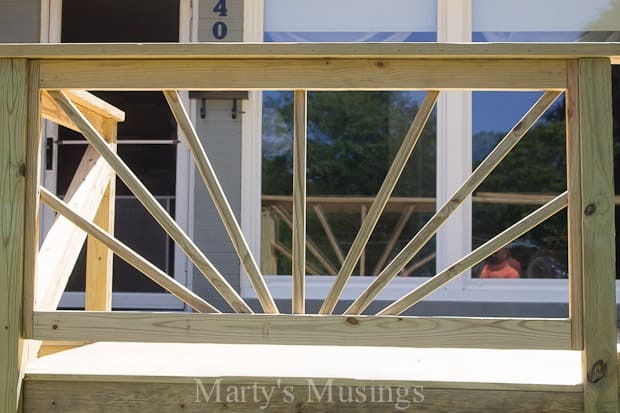 This DIY tutorial will show you how to build a sunburst deck railing with step by step instructions, including materials. 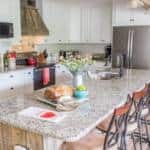 Take your home from ordinary to extraordinary! 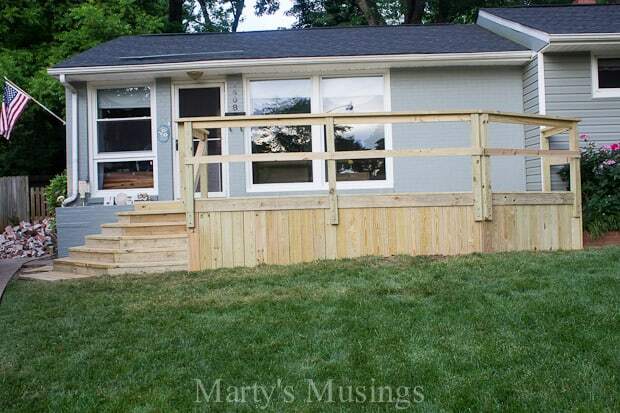 I have loved sharing our front deck project this summer with my readers, but I have to tell you that it has gotten some negative reviews (you can view the thread here). Like many of you, at one point in my life I wasn’t confident enough and desired the approval of others but thank goodness I’m older wiser now! 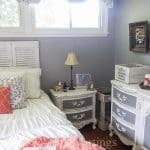 Since I am a true southerner (born, bred and lived here most of my life) I treated this space like a porch and used it to welcome everyone with a casual and homey feel. My very favorite part? 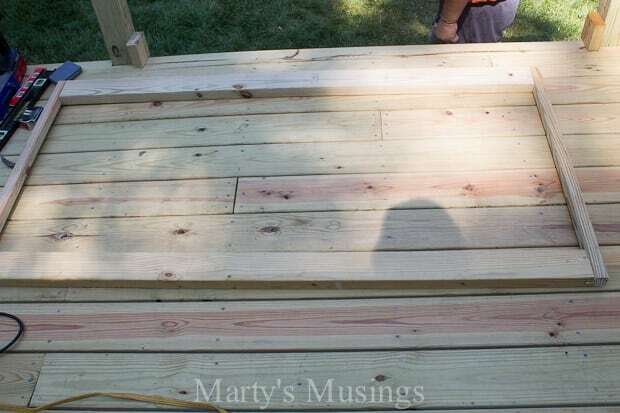 My DIY hubby‘s clever railing. 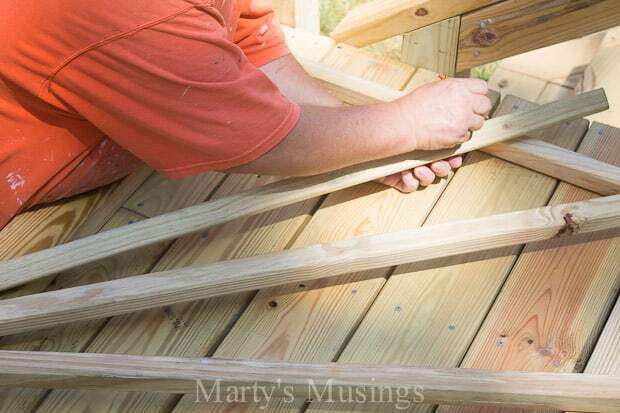 Here he is to give you all the details on how to build a sunburst deck railing! 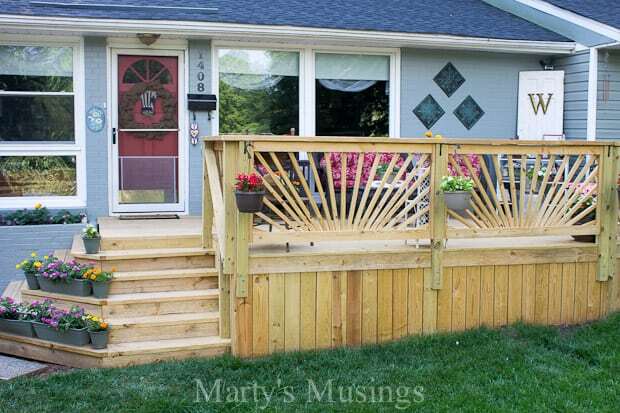 From Tim: I really wanted to do something special with the railings. This would have huge curb exposure, so the “same ol’ same ol'” was not an option. 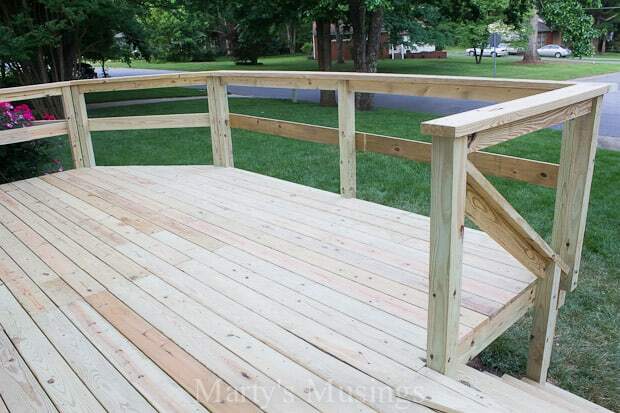 I am not a finish carpenter so some of the more complex designs were not an option either. After some research, I decided on a sunburst design. I could not have been more pleased with the finished product…but we didn’t get there right away! 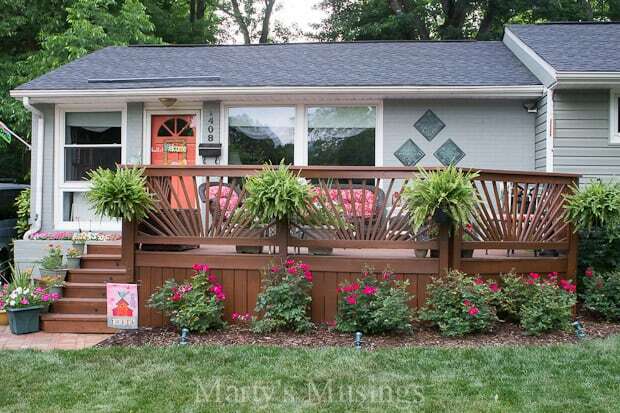 There are 5 panels approximately six feet wide and 38″ from the deck to the top rail. 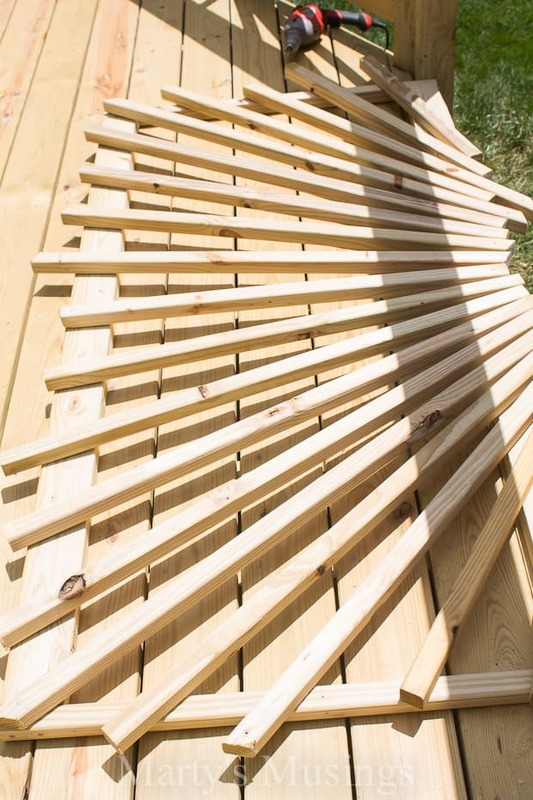 The horizontal mid-rails are only temporary. 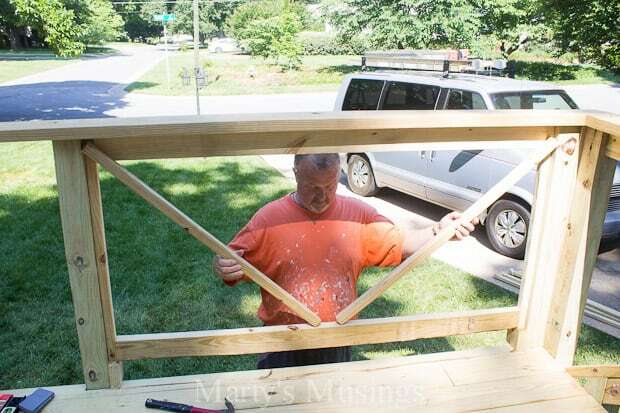 I knew that making individual panels, each on their own frame, would be a much easier build. 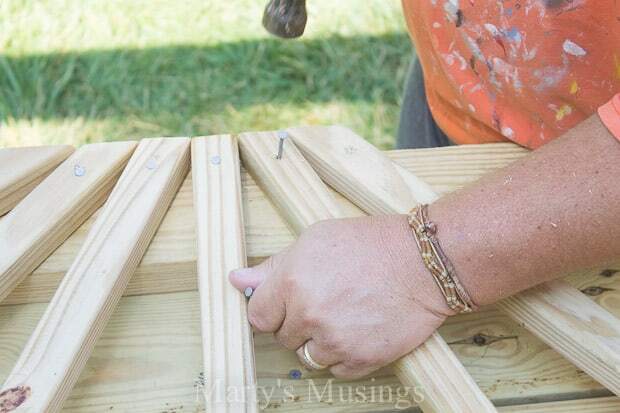 Once complete, they would simply be inserted into the opening and attached to the posts with long screws. 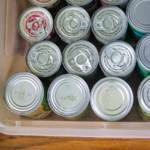 This would also allow for easier maintenance down the road. 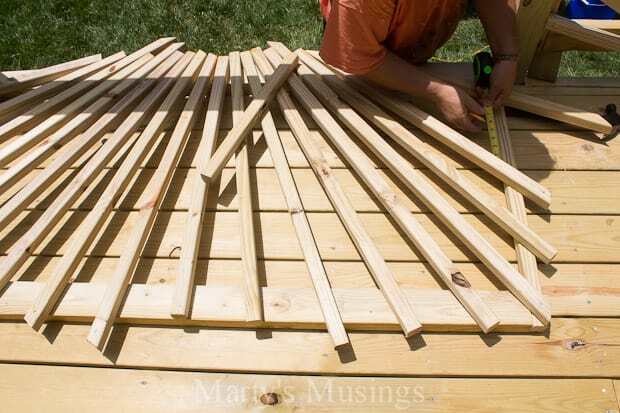 The frames are 2″ x 4″ horizontals and raw pickets for the vertical and the sunburst rays. Just noodling-out the design now, which would turn out to be non-compliant with local deck codes…keep reading! The design that made the most sense was to go from center to each upper corner and then space everything else out in equal distances between those points. Roughing out the design gave me 7 sunburst rays, which I thought looked like a nice design. 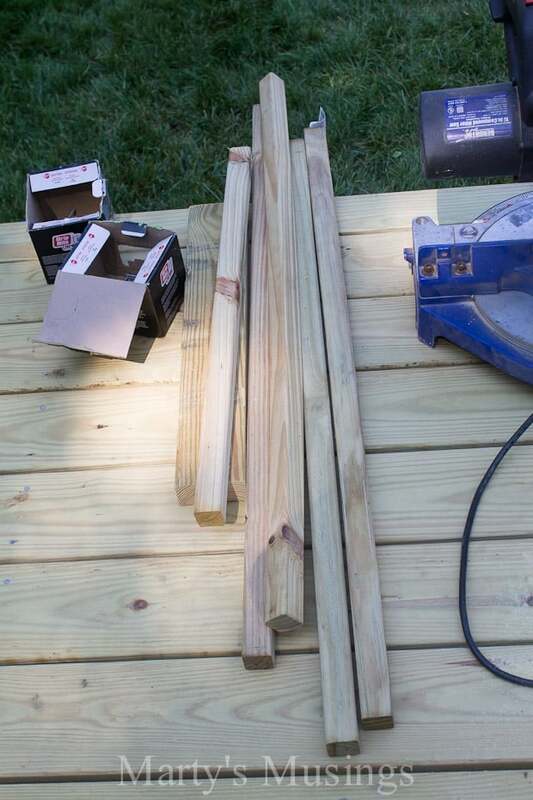 At first, I was marking and cutting each picket and then nailing it to the frame with 2-1/2″ deck nails. I would later shift to nailing them in place and then cutting all of them off at the same time. I also pre-drilled every hole so that the wood would resist splitting. 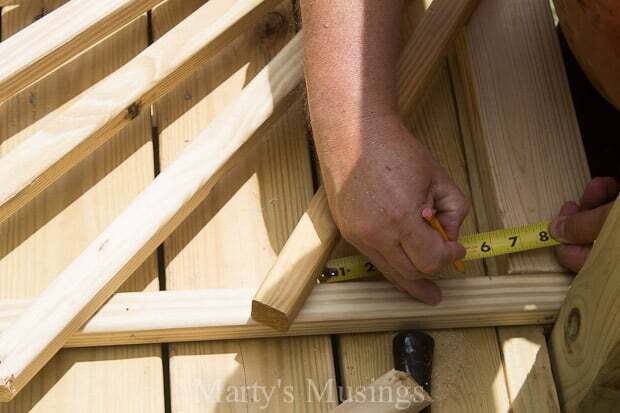 Measure, mark, cut, repeat. Again, at this stage, I was just creating equal distances between each picket. SURPRISE! 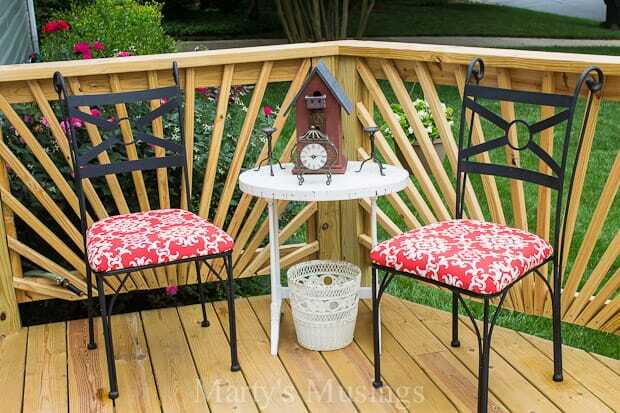 The first design was out of compliance for spacing of railing pickets! They must be no further than 5″ at the widest point for safety reasons…don’t want a munchkin getting the noggin stuck. SO, this called for a re-design. I would HIGHLY advise checking the code in your area. The second design allowed for compliance, spacing each picket no more than 4-1/2″ from its neighbor…that’s just how the spacing worked out for balance and symmetry. Again, measure, mark, cut, attach. You can see here how I left each picket a bit long. 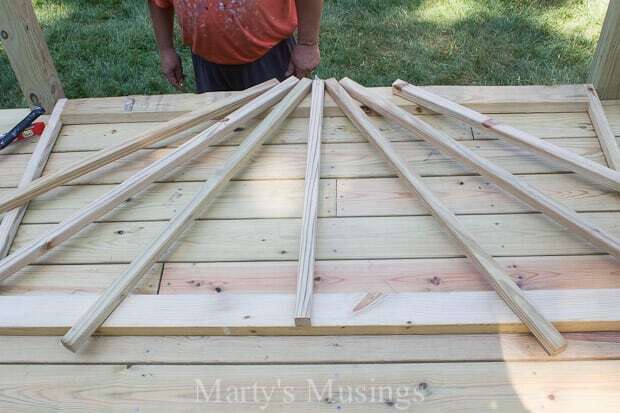 Once nailed, I just cut all the pickets off right at the edge of the frame. The only pickets that stayed in their original locations were the center and the two corners. Everything else adjusted to them. Remember, measure twice…cut once! I did make some minor adjustments because each frame was not the exact same size as the other. And here is the finished…and COMPLIANT… design! It is a bit more busy than I originally intended, but this design gives us substantially more privacy. So, we went from seven pickets to nineteen! We have since established a flower bed with six beautiful red knock-out roses across the front. These should really soften the bottom part of the visual. 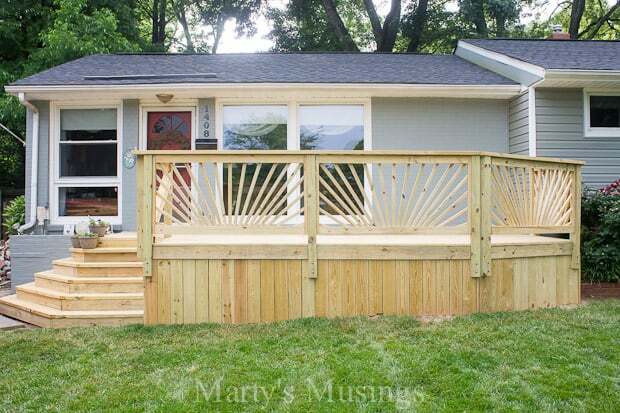 Didn’t my guy do a great job showing us how to build a sunburst deck railing? 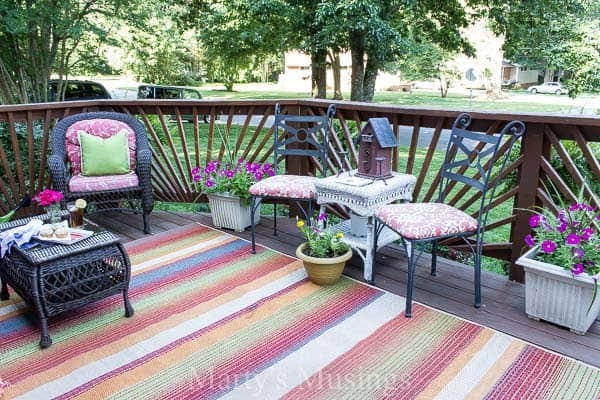 I love the way the railing is accentuated with the pops of color on the deck. Here’s a picture of it stained and decorated. What a difference! I think of all the negative Nelly’s as I sip my southern sweet iced tea surrounded by my mason jar citronella candles. Y’all come on by and set a spell! 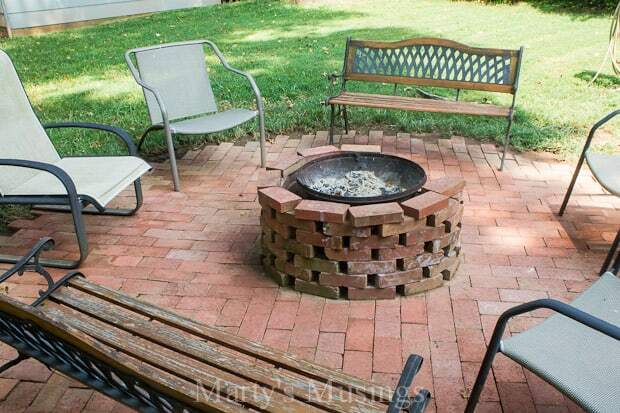 Want to see more of our outdoor projects? 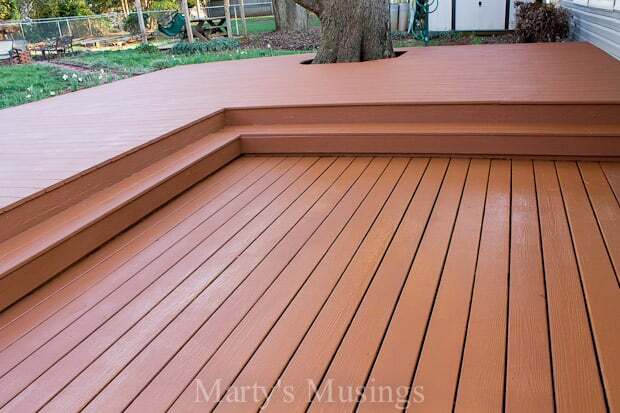 Here are the details on our wood deck restoration. Your front porch looks great. Thanks for sharing your adventures! 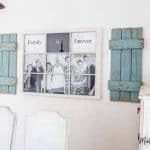 It looks great, adds character to the whole house! Thanks for sharing with Thursday Favorite Things and hope you have an amazing weekend! 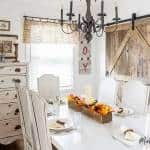 Great work.Very nice to see something different out there.Also seems like a design that could be used on many styles of homes.We can only do so much with vertical posts and I think I’ve seen most of them. 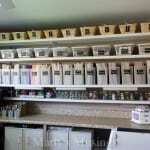 This project looks like quite a bit of work but I must say, the result is well worth it!